Hello and welcome to another edition of Kids Room Alerts. - Laptop Skins – What's Your Favorite? Yeah...I can see you nod. You know what it feels like to have your house taken over by toys – who need worry about aliens when there are dinosaurs and Barbie dolls? Let us figure out some innovative toy storage solutions today. We continue to check out more online players to help you find all your decorating solutions under one roof, err, I mean one click?! 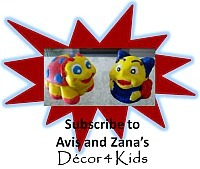 This month our focus was on Wall Decor. After all this is the easiest and most fun way to create a room's theme. WallCandy® Arts: Now isn't that a lovely name for a company providing wall stickers perfect for a kids room? And if you check out their site, you find that it truly is eye candy stuff. 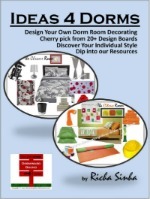 And they have also brought in their savvy design to furniture, home decor, playthings, books and more. RoomMates Peel and Stick : Another big player in the wall decor field, RoomMates peel and stick wall stickers are just the thing you are looking for...if your kid's interests change as quickly as their clothes get short! Murals and wall decals of their absolute favorite characters, custom decals and borders are a sure hit. But my favorite has to be the Mirrors. And the price is pretty cool too. Once your baby is ready to move out of the crib, you simply have to find him a toddler bed. A crib can be quite dangerous for an overgrown baby, since it is much higher and the child tends to move a lot in his sleep at this age. You need a bed that is lower to the ground and also gives him space. Of course, if you have invested in a convertible crib, you are in luck. But if you are expecting a second addition to the family, the crib will have to stay as is. Give your toddler a bed to fall in love with. Some day he will appreciate your hard work too. 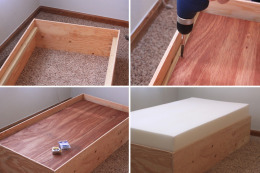 Here is a step by step guide to help you build your own toddler bed...and upholster it in your own style. Just so I do not miss any important steps, I have re-printed her tutorial as is. Part one: Build the base. -4 pieces plywood, 3/8" thick. 10" x 51"
-4 pieces plywood, 3/8" thick. 10" x 25"
-2 pieces plywood, 1/4" thick. 24" x 48"
-Screws #6, 1 1/4 inch. 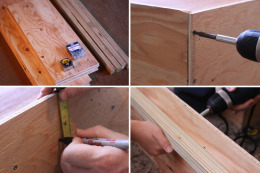 -Make a rectangular box with the 10" pieces of wood. Two short pieces and two long pieces. Attach with 3 screws on each side. This is easier if you pre-drill. -On the long sides, make a mark at 2.5 inches along the outside and at 2 inches along the inside. -Align one piece of the 2 x 2 inch wood so that the top hits just under the inside marks. Use clamps to brace or have a helper hold in place. -From the outside of the box drill in along the 2.5 mark at 5 places along the rail. Repeat on other side of box. -Lay 24 x 48 plywood on rails. Attach with 2 screws on each side. And that's it. The mattress will rest inside the two inch lip. Don't worry if the box is a bit rough ¡ª if the screws aren't perfectly aligned, etc. The box will be completely covered by fabric. I didn't include the price of the mattress in the project because most people in need of a toddler bed will already have a crib size mattress from their crib. If you do plan to use a standard crib mattress, you'll need to make adjustments to the size of the base. Standard crib mattresses are 52¡å x 26¡å, which will be a bit too big for this base. But be sure to measure the mattress you own. They vary. My crib mattress has been used by 5 kids and is failing. So we ordered two custom ones to fit the bases I'd designed. We ordered them from: The Foam Factory. 6 x 24.5 x 49.5 inches. $48 each. 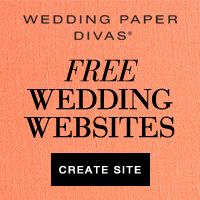 Free shipping if your order is over $75. So place your order with a buddy. -About 4.5 yards of fabric. You could use much less if you don't mind seaming it together. 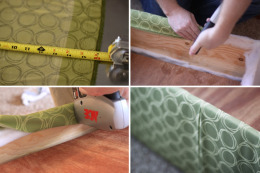 For each bed, you'll need a strip of fabric 16 inches wide by 4.5 yards long. -Roll out your cotton batting and fold over so you have a double thickness. -Cut into 3 double-thick strips about 15 inches wide each. For each bed, you'll use about 1 1/2 lengths of this double thick, 15 inch wide batting. 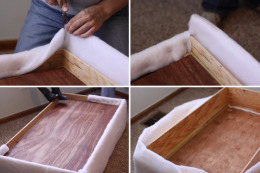 -Place the folded edge of the batting over the top edge of the bed frame. Attach it to the bed frame with a staple gun. -Trim the corners, so that you can attach them more securely. -Keep wrapping the cotton around until your length runs out. Then add the next length. -Turn the bed over and pull the batting tightly around the bottom edge. Staple away. -Once the batting is secure, it's time to add the fabric. 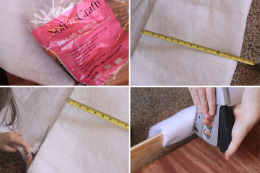 -Measure and cut the fabric so that you have a 16 inch wide piece that is approximately 4.5 yards long. You could also piece 16 inch lengths together to make one long strip. -Starting on the bottom of the bed, staple the fabric over the cotton batting. -At the corners, just fold and staple tightly. -Once you've gone around the bottom, turn the bed over. Fold the fabric underneath itself so the edges don't fray, and staple the fabric over the cotton on the top edge as well. -Where the fabric joins, fold the edge underneath itself and staple tightly. I put my seam at the head of the bed - that way it's hidden against the wall. Getting the toddler bed ready is only half the story though. Now you need some good toddler bedding to complete the look. Isn't this Winnie the Pooh bedding absolutely perfect? The colors are vibrant and the setting is idyll. Don¡¯t throw the old crib sheets away yet; with night-time 'accidents' they will come in very handy. There are many more different themes for Toddler Bedding that you can choose from.. This newsletter is our way of getting to know you better. 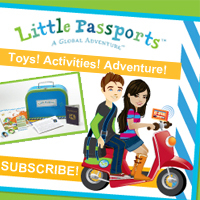 Is there something specific that you would like to see on our site or in our e-zine? Tell us what you like and do not like (really?) about our site. Get in touch with us and make your voice heard.